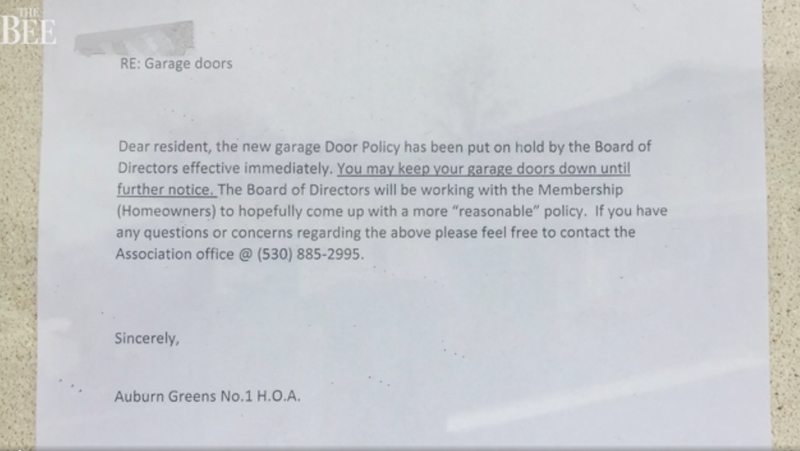 A homeowners’ association in Auburn, California has rescinded its imbecilic policy that allegedly forced owners to keep their overhead doors open from 8 a.m. to 4 p.m. Monday through Friday, The Sacramento Bee reports. Thank goodness—perhaps there is hope for this world yet. According to Sacramento-based news channel KCRA 3, the Auburn Greens complex HOA in Placer County, California decided in the fall to enact a policy aimed at preventing people from living in garages. That policy, a work of true brilliance, required residents to keep their garage doors open during the day, or else face a $200 fine. The newspaper spoke with a resident, who said he hadn’t been notified of the change in the rule, so perhaps the HOA hasn’t gotten around to letting its constituents know. The more interesting part of The Sacramento Bee’s story, though, is the comment from a landlord named James Croci. He provides a bit of context for the HOA’s open-door policy, telling the newspaper that the neighborhood used to just be a bunch of fourplexes with carports, which were meant to be maintained by the HOA. Still, if folks weren’t supposed to install garage doors, you’d think that should have been enforced at the time. Now that the doors have been in place for a while (and presumably some residents assumed they’d have a closed garage when moving in), requiring folks to keep them open still seems silly. Hopefully the neighborhood and the HOA can work together on a more logical solution.